Welcome to the web site of Theoretical Subatomic Physics research at the Department of Physics, Chalmers University of Technology. These pages describe a unique theoretical research environment that includes research groups within astroparticle, nuclear, and particle physics. 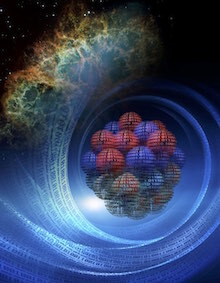 What is the size of the atomic nucleus? 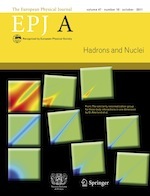 "The similarity renormalization group for three-body interactions in one dimension", selected to illustrate the front cover of the European Physical Journal A in October, 2011. It was also selected by the Editorial Board as the highlighted paper of that month. http://www.epj.org/highlight_paper_a.html In a paper published in Nature Physics we use America's most powerful supercomputer, Titan, to compute the neutron distribution and related observables of calcium-48. These calculations also impact the size of a neutron star, thereby connecting objects that differ in size by 18 orders of magnitude. The European Physical Journal A, Volume 47, Number 10, 122, The similarity renormalization group for three-body interactions in one dimension by O. Åkerlund, E. J. Lindgren, J. Bergsten, B. Grevholm, P. Lerner, R. Linscott, C. Forssén and L. Platter, Copyright (c) 2011, SIF, Springer-Verlag Berlin Heidelberg. With kind permission of the European Physical Journal (EPJ). Nature Physics (2015) doi:10.1038/nphys3529, Neutron and weak-charge distributions of the 48Ca nucleus by G. Hagen, A. Ekström, C. Forssén, G. R. Jansen, W. Nazarewicz, T. Papenbrock, K. A. Wendt, S. Bacca, N. Barnea, B. Carlsson, C. Drischler, K. Hebeler, M. Hjorth-Jensen, M. Miorelli, G. Orlandini, A. Schwenk, and J. Simonis. Image credit: Oak Ridge National Laboratory, U.S. Dept. of Energy; conceptual art by LeJean Hardin and Andy Sproles.